Do you wish to keep your plants, trees and garden as bright and sunny as the weather this summer? Thinking of creating an amazing summer landscape, but don’t know how? No worries! Seeking advice from qualified tree surgeons in Guildford can be the ideal way to beautify your garden during the summer season. Summer can be an exciting season for gardening when you think about everything that’s available during this time of the year. But, with the scorching sun, rising temperature and unwelcome pests, keeping plants perky are of utmost importance for every gardener. But, when the heat starts beating down, how can you keep your garden thriving all summer long? Here’re a few useful tips shared by professional arborists to keep your garden looking beautiful through the summer! While the summer temperature may be warmer and drier, you do not have to spend your leisure by watering your plants. All you need to do is be a bit smarter about watering. You need to follow the typical rule of thumb of watering the flowerbeds twice a week with ample water. Leading arborists suggest that this will be more effective than watering your plants frequently with less water. Experts suggest you keep a watchful eye on your garden and remove all damaged, dead, or diseased debris when they block growth and airflow. If you notice plants with dead blooms, consider seeking tree surgery in Guildford to cut them back instantly for ensuring it grows healthier by next season. This is because; light pruning throughout the year encourages steady growth, building a healthy plant. Additionally, you need to be vigilant about dealing with weeds. It’s never too late to mulch! If your garden beds have mulch which is less than 2-4 inches, consider mulching right away to reduce weeds and conserve water. Since weeds steal nutrients and water from your soil, keeping them at bay is important. Remember; mulching is a great way to ensure your garden thrives all throughout the summer. This is another essential aspect you must keep in mind. Container plants tend to lose their nutrients very quickly owing to frequent watering during the summer months. So, instead of fertilising as often as you can, fertilise your plants once a week. Consider using half of what the fertiliser calls for, as over-fertilizing can cause stress in plants. During the summer months, bugs can be so abundant that it can be overwhelming. Embracing good bugs like bees, ladybugs, spiders and praying mantises to avoid unwanted bugs like Japanese beetles and aphids can be an informed decision. Experienced tree surgeons in Weybridge suggest that placing birdbaths, birdhouses, as well as birdfeeders throughout your yard, attracts birds which control the populations of unwanted insects. So what are you still here for? 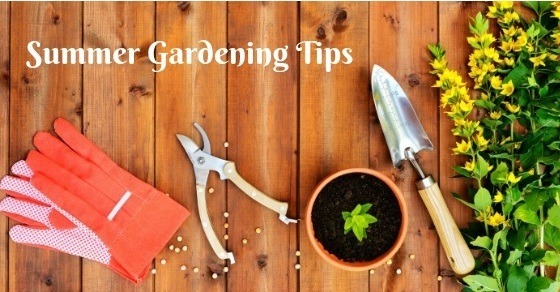 Follow the above useful tips and keep your garden in tip-top shape this summer!